I hope you stay with me to the end of this post. I want to give you something rather ambitious, a new way of thinking about Paul's letters. Paul's moral vision in particular. Many of Paul's letters are a strange combination. Part A is a theological treatise showing how grace comes to us through faith in Christ rather than by the works of the Law. Part A is then followed by Part B where Paul turns to a list of moral imperatives that Christian communities should follow. It's a weird mixture that creates some whiplash. We are saved by faith but there are still all these moral things you still have to do. So which is it? If you want to preach a sermon about grace you pull your texts from Part A of Paul's letters. And if you want to preach a sermon about discipleship and holiness and moral purity you pull texts from Part B. What can account for this strange mixture? The traditional way of handling the disjoint is to discuss the relationships between justification and sanctification. Justification is the subject of Part A in Paul's letters. We are declared "righteousness" by God through faith in Jesus and not by the works of the Law. By contrast, Part B of Paul's letters deals with sanctification, the ongoing pursuit of conforming our lives to the example of Jesus. Justification starts us on the journey and sanctification keeps us on the path. I don't wholly disagree with this way of handing the theological (Part A) and moral (Part B) aspects of Paul's letters. There is some truth here. But there is also much distortion. Much of that distortion has to do with how we understand what Paul means by "works of the Law." As work in the New Perspective on Paul has shown, in Paul "works of the Law" doesn't refer to a legalistic moral effort aimed at "earning" our salvation. "Works of the Law" doesn't refer to the human conceit that we can, all on our own, become morally perfect and, thus, "earn our way" into heaven. "Works of the Law" doesn't refer to merit, a sort of moral currency we can collect through good deeds that can be used to purchase our salvation. "Works of the Law" has nothing to do with any of that. And yet, you will note, this is the very assumption that creates the disjoint between Part A and Part B of Paul's letters. If the "works of the Law" in Part A is referring to human moral effort to justify ourselves before God then, yes, there is a bit of whiplash when Paul apparently shifts and starts demanding moral behavior. True, the justification/sanctification frame helps a bit but it doesn't completely alleviate the tensions. Many now think that this tension is being produced by a misunderstanding of what Paul means by "works of the Law." The tension between Part A and Part B in Paul's letters isn't a problem with Paul. The problem is with us. If so, then what does Paul mean by "works of the Law"? As the new Pauline scholarship has helped make clear, "works of the Law" mainly means circumcision, the means by which a person becomes a participant in the covenant of Abraham. Salvation comes to us via the covenant God made with Abraham. Consequently, the critical question for Paul and the early Christian community was how the Gentiles gained access to that covenant. Among the early Christians there were two schools of thought. The first school of thought was that the Gentiles had to convert to Judaism and be circumcised. This is what Paul is referring to by "works of the Law." It's not too much of a simplification to simply read "works of the Law" as "circumcision" when reading Part A of Paul's letters. The point for our discussion is simply this. With this new understanding in hand we see that in Paul "works of the Law" isn't about human moral effort (trying to earn our salvation) than it is about identity, Jewish identity in particular. The only way to get access to the promises God made to Abraham was to become a part of Abraham's offspring. Thus, Gentiles needed to become Jews. Jews, yes, who believed that Jesus was the Messiah and that God's promises to Abraham were inaugurated and fulfilled in Jesus, but Jews nonetheless. In contrast to this circumcision-based vision there was another school of thought, the gospel proclaimed by Paul. According to Paul, faith in Jesus--a circumcision symbolized by Christian baptism--was sufficient to gain access to the covenant of Abraham. Through faith the Gentiles could become Abraham's offspring and be grafted into the covenantal promises made to Israel. A Gentile didn't need to be circumcised. We are justified--brought into the family of God--by faith alone. In short, Part A of Paul's letters isn't about the human effort to earn salvation. Part A of Paul's letters is about the inclusion of the Gentiles into the story of Israel via faith in Jesus Christ. And this issue was, we know, the central debate of the early church and the question at the heart of the first apostolic counsel recounted in Acts 15. Readers well-read in this area will have been nodding along. Nothing I've just written is new. I'm just summarizing it for others to get everyone on the same page. Because what I want to do in this post is shift focus to Part B of Paul's letters, to get a better vision of how what Paul is doing in Part A (his theological account about how Gentiles get included by faith) informs what he's trying to do in Part B (all his moral imperatives). Specifically, how does Paul's rejection of circumcision specifically and Torah obedience generally inform what he's trying to do in Part B--the moral vision--of his letters? The answer goes to how the Jews saw obedience to the Torah as an agent of grace in distinguishing them from the moral depravity of the Gentiles and pagans. The Torah made the Jews holy, separating them from the degeneracy of the world. In the eyes of Israel the pagans were depraved and perverse, especially when it came to sexuality. Pagans were unable to control themselves, almost bestial in nature and appetite. But because of God's law Israel was spared this fate. Torah obedience gave Israel a moral integrity that the pagans lacked. Suddenly, we can see Paul's problem and why Part A flows into Part B of his letters. If "faith alone" in Jesus Christ jettisons Torah obedience then Paul faces a quandary. Without the Torah how are all these morally depraved Gentiles going to be a people of moral integrity? Where is this moral integrity to come from if the Torah is marginalized? Because most of Paul's contemporaries would have felt that without the Torah it would be impossible for the Gentiles to become a people of moral integrity the way Torah-obedience Jewish Christians were. In short, Paul's gospel of "faith alone" inaugurated a grand moral experiment. Perhaps "faith alone" in Jesus Christ could function as a sort of "circumcision" grafting the Gentiles into the promises made to Israel. But how could that "faith alone" gospel transform morally and sexually depraved pagans into a people characterized by holiness and moral integrity? If the inclusion of the Gentiles was Paul's first big issue then the moral integrity of depraved pagans was his second big issue. Paul generally deals with the first issue--inclusion--in Part A of his letters and the second issue--moral integrity--in Part B of his letters. But the two parts are related in that they are both working through the implications--theological (Part A) and moral (Part B)--of marginalizing Torah obedience and the "works of the Law." So there is no disjoint in Paul's letters. Paul is trying to bring the Gentiles into Israel ceremonially (through baptism rather than circumcision) and morally. Paul's letters are working both aspects of the problem. With this in mind I want us to step back and ponder what Paul was trying to do and the skepticism he faced in starting these Gentile churches. Paul was setting up these Jesus-communities whose members consisted of, in the eyes of skeptical Jewish onlookers, morally depraved and wicked people. To Jewish onlookers it looked like Paul was handing the keys to the liquor cabinet to a bunch of alcoholics. Morally speaking, this was a recipe for disaster. Paul was hopping around, going from city to city, setting up these communities. And then leaving them! Without the Torah, and the habits of spiritual formation embedded in the culture of faith communities who had been shaped by Torah obedience generation after generation, how were these new Gentile Christians going to lead holy lives? This was the great moral experiment of Paul's gospel. Could a new form of moral flourishing emerge among the Gentiles separate from the Torah? Given how the Jews regarded the moral depravity of the Gentiles the prospects of Paul being successful looked bleak. There was no way pagans could become holy without the Torah. But Paul took a shot at it. So, how'd he go about doing it? By way of summary I think we can note three things as being at the heart of Paul's moral vision. First, there is Paul's pneumatology. Paul felt that, rather than the Torah, the Holy Spirit, having been poured out upon the Gentiles, would give them the capacity to be moral. For the entire law is fulfilled in keeping this one command: "Love your neighbor as yourself." Finally, rather than pointing to the Torah Paul points to the example of Jesus. For example, Philippians 2.5: "In your relationships with one another, have the same mindset as Christ Jesus." Paul also points to how that example is manifested in his own life: "Be imitators of me, as I am of Christ." (I Cor. 11.1). In a nutshell this was the heart of Paul's vision for morally forming Gentiles: The Holy Spirit, the Golden Rule, and the Imitation of Christ. This, Paul felt, would be enough to transform depraved pagans into a "holy people." And yet, these general principles couldn't cover all the moral situations Paul's fledgling churches would face. For example, consider the situation in 1 Corinthians 5 where a man is sleeping with this father's wife. This was the nightmare scenario for Paul, the thing everyone predicted would happen if you tried to get sexually depraved Gentiles to be sexually pure without the Torah. See, the critics of Paul would chirp, Paul has always been on a fool's errand! Look at the sexual depravity of the Corinthian church! That's what happens when you don't follow Torah! I wrote to you in my letter not to associate with sexually immoral people— not at all meaning the people of this world who are immoral, or the greedy and swindlers, or idolaters. In that case you would have to leave this world. But now I am writing to you that you must not associate with anyone who claims to be a brother or sister but is sexually immoral or greedy, an idolater or slanderer, a drunkard or swindler. Do not even eat with such people. Paul doesn't care about outsiders. It's not his concern to judge those outside the church. But Paul's entire gospel hangs in the balance--this crazy moral experiment he's attempting--with the moral witness of his faith community. If they can't get their act together then Paul's gospel is discredited. The rival and alternative gospel of Torah obedience will win the day. Gentile Christians must become Jews. It's all coming apart at the seams in 1 Corinthians 5. Paul's calling, mission and gospel hang in the balance. So we can, perhaps, understand a bit of Paul's severity and forcefulness. All of this brings me to my final and concluding observations. The point of the post. First, the reason I've gone into describing all this is that I think it helps us understand Paul's harshness, Jewishness and conservatism. Specifically, Paul's Gentile churches were moral demonstrations to Jewish skeptics. And I think this explains a lot of why when Paul gets outside the core of his moral vision--the Golden Rule, the example of Jesus--he falls back upon Jewish (and Greco-Roman) visions of moral flourishing. I think this is why, for example, Paul's household codes are patriarchal. That's what Jewish moral flourishing at that time looked like. And given the skepticism Paul faced he was keen to make Gentile households look like Jewish households, seasoned albeit by the love ethic of Jesus (e.g., mutual submission). Still, despite the Jewish flavor Paul occasionally inserts, the moral flourishing in Paul's Gentile churches was different from the moral flourishing found in Jewish communities. Which brings me to my final and more provocative point. While Paul's moral directives have a Jewish and conservative bent (in relation to the surrounding pagan culture) it remains a fact that the moral flourishing observed in Paul's churches was not Jewish or conservative, at least by orthodox Jewish standards. Paul was doing something risky and experimental, cultivating a new form of moral flourishing with a group of people considered to be morally and sexually depraved. True, Paul was morally demanding of these communities, but this was necessary to create the moral distinctiveness his gospel needed to legitimate itself before Christian Jewish skeptics. In short, by failing to understand the backdrop of Jewish skepticism about Paul's churches Paul's moral conservatism and harshness can mask just how novel, liberal, uncertain, innovative and experimental these communities were in creating a new form of moral flourishing. They were trying to be holy Gentile communities. And that idea was both radical and outrageous. In the end Paul was vindicated in that a new form of holiness--Gentile Christian holiness--did emerge out of his missionary efforts. Morally speaking, Paul's gospel had created something new and unprecedented. And Paul's moral experiment continues. Every time the gospel message enters a new cultural context a new form of moral flourishing has to be worked out. At this time and place and with these people what shape will a Christ-centered holiness take? And taking a cue from Paul here's what I think about how we should approach that question. As the early Jewish criticism of Paul's churches has waned I think we can revisit the core of Paul's moral vision: the Holy Spirit, the Golden Rule and the Imitation of Christ. That is, as new forms of moral flourishing emerge with the advance of the gospel we go back to these central elements. Now, of course, some might also want to carry forward, piecemeal, Jewish (and Greco-Roman) particulars that Paul used in various instances to resolve specific issues his churches faced (e.g., the household codes). But I think that would be missing what Paul was doing. Paul wasn't demanding that his churches be morally identical to Jews. His churches were experimental and different from Jewish communities. But Paul did need to show, in the defense of his gospel, a least a family resemblance between the two communities. Again, what Paul was after was a moral demonstration. Paul wasn't trying to give timeless laws. He was trying to show that Gentiles could be holy, albeit in their own distinctive way. In short, the moral flourishing among the Gentiles was innovative, unprecedented and not a legalistic adherence of the Torah. And this suggests to me that insisting upon the cultural practices rooted in Torah observance within Paul's moral teaching--that we must follow these parts slavishly, literally and legalistically--ironically misses the point that Paul was resisting a slavish, literal and legalistic observance of the Torah. Legalistically and literally following Paul's specific moral directives misses the point that Paul was cultivating, tweaking and experimenting with a new, innovative and unprecedented form of moral flourishing. To follow Paul slavishly, literally and legalistically misses the risky, daring and experimental nature of what Paul was doing. Now, does that mean anything goes? No, Paul had some central principles that he kept coming back to. We have to do the same, over and over again. But let's be clear, Paul took a risk. Paul didn't know how it was all going to turn out. Neither will we. You can only judge by the outcomes by the degree to which they conform to the self-giving love of Jesus and the fruits of the Spirit. At the end of the day, that's how Paul assessed his own moral experiments. Paul wasn't getting his churches to follow a new set of rules, a new Torah of his own making. Paul wasn't trying to be Moses. So we shouldn't treat him as Moses. Paul was curating, nurturing, shaping and cultivating communities to bring into existence a new and innovative form of moral flourishing where pagans could become shaped into the image of Jesus. And I think that adventure continues. Along with all the uncertainty, open-endedness, controversy, innovation, experimentation and risk that characterized the ministry of Paul. I would say that "the uncertainty, open-endedness, controversy, innovation, experimentation and risk that characterized the ministry of Paul" characterizes this blog as well, in ways that have made it such a life saver to me. Hear, hear on all of the above (and thanks) but one question, and I apologize in advance for its length: Is it possible to view the sharp advice in 1 Corinthians 5, to expel the immoral brother, as an example, not so much of Paul's concern for how the new community might be viewed by communities of generationally nurtured Torah-faithful Jewish believers, but, even, as a demonstration of one (or all) of the general principles in fact covering a specific situation: here, the Golden Rule covering this situation? "A man is sleeping with his father's wife." In other words, the problem with sexual immorality of all kinds is one not treating another, not loving another, as one would be loved; i.e., de-humanizing, objectifying, etc. an "other"
In this specific case, assuming for a moment the father whose wife and son are at issue is still alive: the two sleeping together - assuming consent between them = are nonetheless de-humanzing that father, violating his wishes, his initial understanding of the marriage vows, and so not honoring the Golden Rule. Or, assuming for a moment the father whose wife and son are at issue has passed away: the wife then is presumably a widow and the son should care for her, not dehumanize her by taking advantage of her state by, among things, sleeping with her - consent can never be assumed in such a situation..(I'm thinking the "wife" is not the son's mother, but is rather the father's (2nd?) wife). This question works off a series of (likely obvious to others) assumptions I have including a new approach to even the Levitical moral codes. I wonder sometimes whether the sexual purity instructions there, at heart, require a patriarch to not de-humanize any of those in his care (deemed at that time to be his property and over which he had absolute legal right) whether woman, or child, or servant, or even animal, by, among other things, violating them sexually. So that, in effect, what Paul is saying in 1 Corinthians 5 is "stop associating with anyone who claiims to be a part of this but is sexually immoral - and boasts about it on top of that. The lack of humanity and love inherent in sexual immorality violates these general principles." (Another assumption I have, obviously, is that in addition to Christ-like love and care, sexual purity requires primarily only faithfulness and consent, no matter the gender of the partners involved).. In short, I wonder if the general principles so well described above are in fact enough such as they are? if part of just how breath-taking grace/the new covenant/what Paul was setting up/what Christ expects-believes about us is just that ennobling and empowering? that the Spirit, love, and Christ's example, while sometimes requiring discernment and involving complexity, make most things clear enough and/or a matter of our individual consciences. I apologize, I'm repeating myself. I ask in what I believe to be good faith, not seeking to upset anyone. Although my interest in these matters is more than casual, I do not claim to be a Christian believer. I love this humanization of Paul. It seems so important that the Epistles are letters with an historical and cultural context. I appreciate your insights and your willingness to share them. I have struggled for quite some time to find a way to reconcile the seemingly strange combination of Paul Part A and Paul Part B. This helps. Thank you. I sense a continuation of this post (part 2). They can only be saved if they pray the sinner's prayer, attend this fellowship Sunday morning, Sunday evening and Wednesday night, read their Bible according to X. WHAT, a gay pastor starting a church in X city? This post is certainly an eye opener, and much appreciated. Though Romans 13:8-10 is cited in the middle of your post, for me it is the conclusion. Love puts the Golden Rule in play. Richard, I agree that what Paul was up to was affirming Identity as The People of God. I'm not sure he was advocating for morality as such. I think if the identity is that of being "in Christ," (throughout Paul's writing) and if Christ is the Image of God, the fullness of him who fills all (Colossians, and elsewhere), then I think his concern in part B continues to be Identity: how the identity of being united to Christ as God and as The Man (1Tim 2.5, Rom 5.15) is worked out in our relationships. This is about far more than "morality," and I think this can still hold Paul's Jewishness. I can't remember if you have said you have read N.T. Wright's first 2 "big books"? ("The New Testament and the People of God," "Jesus and the Victory of God"). If you have time, I would encourage you to read Fr Stephen Freeman's latest series on glory2godforallthings.com. It begins on page 2 with "You're not doing better," "Why sin is not a moral problem," and "Going to hell with terrorists and torturers," and continues on the front page with "The unmoral Christian", "Of course we are called to be moral - a response to my critics," "Eschatological eloquence - Fr Aidan Kimel's response," "While we're at it, an "unmoral" word from the holy mountain," "Making sense of a jumbled world," "The problem of goodness," and "St. Mary of Egypt and moral progress." Many of the comments are also valuable, esp as Fr Stephen interacts. I think you could relate to a lot, esp in your experiences of the prisoners you know. ". . . Paul was curating, nurturing. shaping, and cultivating communities to bring into existence a new and innovative form of moral flourishing where pagans could become shaped into the image of Jesus." Well said Richard! With respect to Gentile inclusion, it appears that while excluding Gentile circumcision should not be an obstacle to their moral flourishing in the faith community, eating certain foods and sexual immorality seems to be a deal breaker, at least in more Jewish churches (Acts 15:28-29). Does Romans 14-15 indicate Paul's rethinking of this mandate in light of his pastoral concern for community solidarity and the priority of Kingdom values? How do we create sacred space in the faith community to encourage the cultivation of certain values/virtues that witness to the alternative way of the Kingdom before our own pagan environment? E.g., could the church best challenge and witness to the broader gay community by creating space where gays can morally flourish either by the discipline(s) demanded of a celibate life, or by cultivating covenantal relationships where the values of sacrificial love, faithfulness, and sexuality are framed and nurtured in a monogamous relationship? And, where communal Kingdom values are shared in a diverse witness to our broader culture. I don't mean to open a controversial thread, I'm just reflecting on one possible modern application of Paul's practical concerns. to put it bluntly. this is brilliant. thank you! Wow. Oh my gosh, yes. Reading this through, I think it's possible to frame it like this, that the underlying issue is about a failure of love rather than familial/sexual impropriety. If we read in the assumptions needed to make that work then, yes, it definitely makes Paul's ethics more uniform and simple. Love is the criterion all the way around. Thank you for your reply and for entertaining my assumptions in this context. Thank you. Not the sort of post that would go viral, but this isn't an analysis I've see anywhere else, one with some potentially deep and far-reaching implications. Enjoyable read, I would approach it slightly different by suggesting you have not gone far enough...from my reading of Pauls letters I would suggest he strips away ALL holiness codes...of course he eliminates circumcision, but he also destroys dietary laws (meat offered to idols is almost a direct challenge to the Jerusalem gentile codes handed our by James and the gang), sabbath laws have been tossed, festivals and new moons are no longer valid, from this perch it does not appear to me that Paul is even trying at all to make the new converts resemble anything Jewish at all. I have made it a bit of habit to replace "works of the law" with "Torah"...notice he makes no effort in ANY of his letters to recreate a synagogue model where reading of the Torah could happen and it seems to me on some level that the jewish identity cannot be divorced from Torah, so in my perspective Paul is not simply trying to recreate/compete with jewish morality, he has gone beyond it by suggesting that it is outdated anyway..."of the two one new man"...seems to be his directive. So how do I explain the "part B" passages? Well in my reading of Paul I find the part B passages primarily about how to expediate the kingdom of God now, how does it fit, what shape does it take? Of course like all things your mileage may vary. What does it all have to do with salvation? If one is reading the KJV 1611 or the YLT. The faith of Christ is the term that Paul uses most of the time. As in Gal.2:20 "the life which I now live in the flesh I live by the faith of the Son of God, who loved me and gave himself for me. Kind of a big difference there wouldn't you say. If my life is dependent on my faith I am hopeless. I prefer to live my life dependent on His faith. This is by far one of my favorite posts that you have written. What are the odds you would/could turn this into a series? This is a great post. I'm surprised that you haven't come across such an analysis elsewhere (as you mentioned in a comment below) as those who currently write about "participation" and "being in Christ" would largely agree with you. Also, it also means that you have yet to read through Karl Barth's Church Dogmatics (especially Book III and his conversation on ethics). I think you'd find him to be a wonderful conversational partner and fellow pilgrim. I like your thinking here RB (Pauls Gentile trifecta for holy living). It really simplifies some things. However, now I am wondering about the uncomfortable and certain prospect of moral failings on the part of "insiders" and putting people outside the "assembly" for sexual sins/impure behavior. Has the modern church lost part or all of it's distinctiveness because it has not been as forceful as Paul was with the Corinthians? Great post, Richard. I hadn't really put this disjoint into words before, but it immediately chimes. And I love the way you resolve the tension you introduce - by reframing Paul as a builder of new, innovative communities rather than an enforcer of rules. Again, this 'feels' like a more authentic representation of the transformed Paul who was waylaid on the road to Damascus. Many thanks for taking the time to unfold these thoughts. yes what? can you articulate more of your concern about salvation as it applies to your life? what's going on in your life that needs to ask a question in the context of this comment board? who here might be able to engage in a cromulant conversation w/ you about salvation? what does boots on the ground 'salvation' look like? 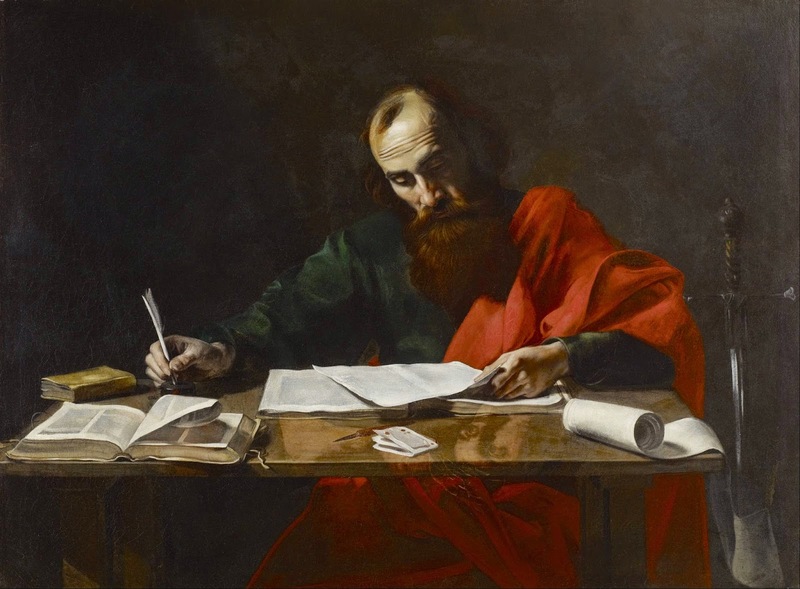 A brilliant dissertation on the writings of Paul's epistles and letters. To read Paul, and get anything from them that shapes up like the ministry of Jesus, I discovered decades ago, requires one to take the entire context of any of his letters and balance them out. Paul was a very apt politician, playing to people's prejudices, usually addressing each division separately, and then knocking off the sharp edges of both sides of an issue to make something that fit into place without conflict. The core of his teachings were the two commandments Jesus told us were paramount and not unalike, love God with your all and love your neighbor as yourself. It was not an easy task, as is shown to one he entrusted with a church at a young age (1 and 2 Timothy), and simple, fundamental literalism will always produce a religious tyranny if one follows that course. Most of our mainstream churches have departed down the fork of literalistic adherence to the old law, while claiming faith in Jesus as their corner stone. This is tantamount to stoning someone to death while stating "judge not lest you be judged." Some denominations do go to the opposite extreme and say just about anything goes, as we are saved by faith alone. I believe that the paradigm that is most succinct here is the model that Jesus set. To love God first, and then to love your neighbor as yourself. As love will never harm anyone and thus fulfills the law, still it is not an easy path to follow and many will perish if followed with due dilligence. Neither Jesus nor Paul ever states that we will be freed from pain and peril if we walk their walks. In fact, he states that the world will hate you for doing so. It is extremely contrary to human beliefs to love one's enemies - let alone supply their needs and pray for their salvation. You will be persecuted and you will be killed for doing this. Still, Jesus promises us the baptism of the Holy Spirit, which will give us both the wisdom and perseverance to walk the appointed path. Just do so with your eyes, and heart, wide open. As I read new thoughts on Paul I am seeing this thought clearing up so much. I have read that it is possible Paul was not present in Acts 15 but that the author put him in the story to help bridge the gap obvious between Paul's experiment and Torah based Christians. Awesome! You have well put and exposited a position I have long held. Thank you for sharing this. I hope you go further with this analysis! I can't stop thinking about how truly enlightened your premise is. I keep applying it to all sorts of real life and "biblical" situations and it keeps making sense!